MARKET WILL BE HELD IN RAIN , HAIL OR SHINE! WE'RE INSIDE!YAY! After the outstanding success and warm feelgoodery of Cuddle Party #1 and Cuddle Party #2, Cuddle Party #3 will take place on SUNDAY JULY 18 at the ARThive Gallery, presented by the fine teamwork of Lesstalk Records, Monstera Deliciosa, and ARThive. With music and other entertainment running throughout the day, and perhaps a bit of food, drink, and other things to buy, you could do worse than spend your Sunday in the gallery curled up on a beanbag with old and new friends. Entry is by donation, with funds raised going towards a new tin of white paint for the gallery, or maybe a drill or a new printer. Would you like to know more? email subjecthive@gmail.com unless you're a pervy weirdo looking for a mad gropefest. Capturing Compassion is the debut exhibition from 18 year old artist Rachael O’Neil, a visual testimony to a three year battle with self annihilation. During the process of treatment for her illness Rachael discovered art as a means to recovery and considers art to be a vital necessity. Her solo show is a positive, uplifting encounter generated from a turbulent experience. An exploration into art as a unique, important and powerful voice in a rationalised, noisy and overly stimulated world. I hope for my works to stir compassion and kindness into the minds and stomachs of those who attend. 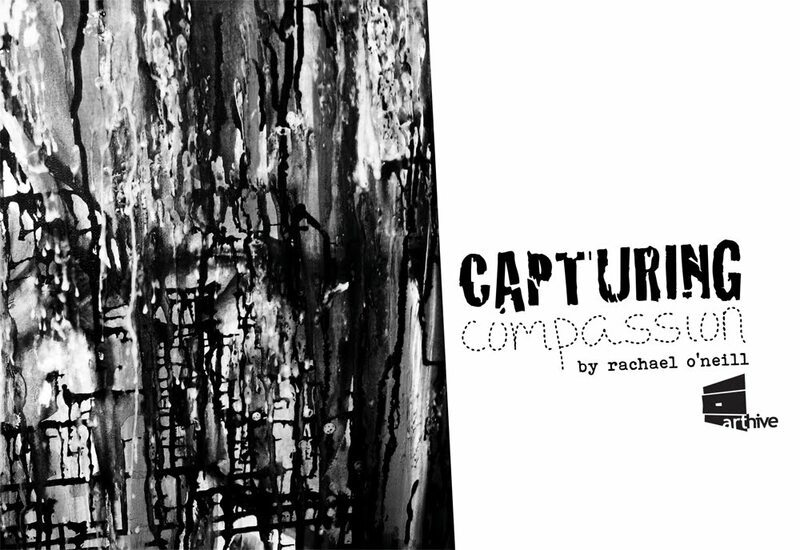 Capturing Compassion offers fields upon fields of undulating colour. Brush stokes ebb and flow before crashing into the viewer’s periphery. This haunting periphery, a long dark tone, is the resounding chord of Rachael O’Neil’s painted symphony. For the spontaneity and joy in this young artists use of colour there is also deep melancholy and meditation. These works bear witness to the process of healing and recovery. The deeply personal nature of this exhibition is secondary only to the artists’ awareness of social illness and abuse. Art can be seen as an antidote to heal societal disease and a voice to those silenced by trauma. I wish to expose people’s minds to a wide range of ideas and perspectives creating more acceptance and appreciation of diversity. A percentage of proceeds from the show will be donated to the domestic violence charity NSW Women's Refuge Movement and to the Human Rights Watch. These charities are dependant on public donation and it is Rachael’s wish to support these valuable networks.